Leon, Castilla y Leon, Spain, stock photography samples, by Per Karlsson, BKWine --- This is a selection of samples. Use Image SEARCH to find more relevant photos --- Leon is a city in the region of Castilla y Leon (Castile and Leon) in north-west Spain. I arrived there being on a wine tour of the wine district in this part of Spain. I only wish I had had more time in Leon. It seemed like an interesting city. 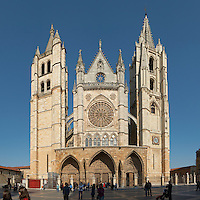 Leon is the capital of the province of Leon with a population of 140,000 people. It is on the Bernesga river and also on the pilgrimage route Camino de Santiago leading to Santiago de Compostela on the Atlantic coast. There are many sites and interesting buildings in Leon. some examples: the magnificent Gothic Santa Maria de Regla cathedral on Plaza de Regla, the Casa de Botines designed by Antoni Gaudi, the Palacio de Guzmanes etc etc. There are also many restaurants and cafés of course. One to mention in particular is the restaurant Imprenta Casado where we had a wonderful lunch with some excellent wines from Castilla y Leon.